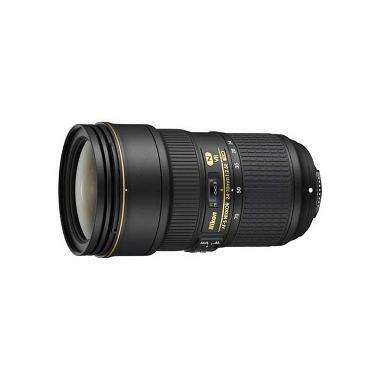 The Nikon 24-70mm f/2.8E AF-S ED VR Lens sports all of the same features as the high quality Nikon 24-70mm f/2.8G AF-S ED but with the added benefit of Vibration Reduction, which helps to reduce the appearance of camera shake by up to 4 shutter speed stops for better handheld shooting in low-light situations. Optically, this version also scores higher than its predecessor with improved refractive index elements for reduced aberrations and distortions. The Nikon 24-70mm f/2.8E AF-S ED VR Lens can be paired with both full frame sensor cameras, such as the Nikon D810, and with crop frame sensor cameras, such as the Nikon D7200. The focal length equivalent on crop frame sensors is 36-105mm. This lens has a versatile wide-angle to short-telephoto focal range, making it well suited for weddings, events, vacations, landscape photography, portraits, videography, and high quality everyday shooting.